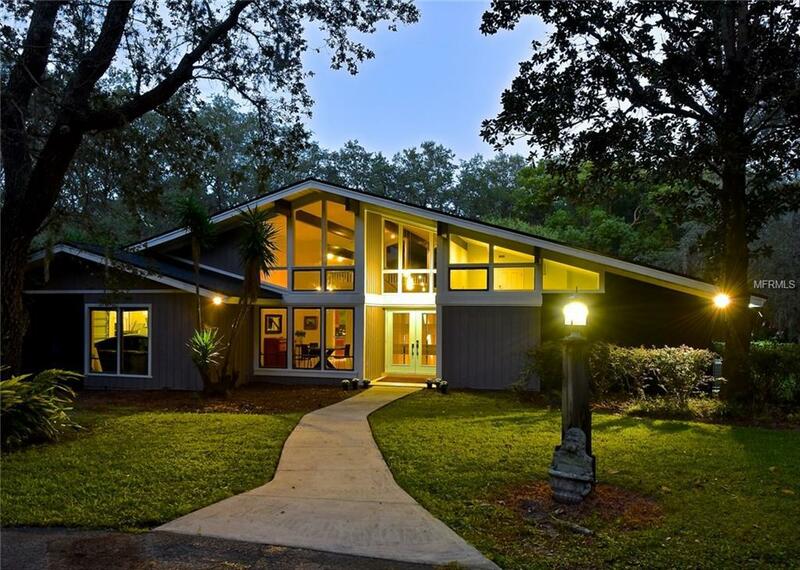 This property offers it all, a tranquil wooded property adjacent to Wentworth Golf Course and the Pinellas Trail with Keystone Road and quick access to Tampa and Clearwater nearby. Electronic Gates lead you down a tree-lined circular drive to a fully fenced 3.2 acres of flat land in the Equestrian community of Oak Hill Acres. Space and zoning offer opportunity for horses, livestock, and dogs. Ownership of over one-third of the adjacent pond provides full irrigation for the property. This Contemporary Executive home with 4 bedrooms and 3 1/2 baths, abounds with open and updated living space. From the entry with volume ceilings and new clearstory windows, youll enter a living/dining area which overlooks the screened in pool, swim spa, and outdoor dining/entertaining areas. The kitchen has new stainless steel appliances, an induction cooktop, and beautiful cabinetry and is open to an expansive family room with gas fireplace, coffee/wine bar and views the pool and landscape. The Ensuite Master Bedroom has been remodeled (2015) complete with soaking tub, rain head, and 6-body jet shower, glass tile, built-ins and his and her closets. NEW Roof (2018), NEW hot water heater (2017), 3 HVAC systems (2016), paint, flooring, doors/hardware, new garage door and much more, in recent upgrades. There is an additional 5 car, 3 horse barn with stalls, or a huge shop with upgraded facia to offer you a multitude of uses for your every hobby. Truly a must see.